Free Printable Bible Easter Word Search. Free Printable Word Search for a Christian Easter celebration. A great activity game to share with kids and students at school, church or at home. Celebrate Easter and try to find all the words and characters from the Bible related to Easter like Apostles, Son of God, Cross, Mary, Lamb, High Priest, Robe, Tomb, Sacrifice, Golgotha, Nails, Pilate, Savior, Risen, Sunday, Simon of Cyrene and many more. The word search includes 24 words from Bible Easter and the answers on page 2. 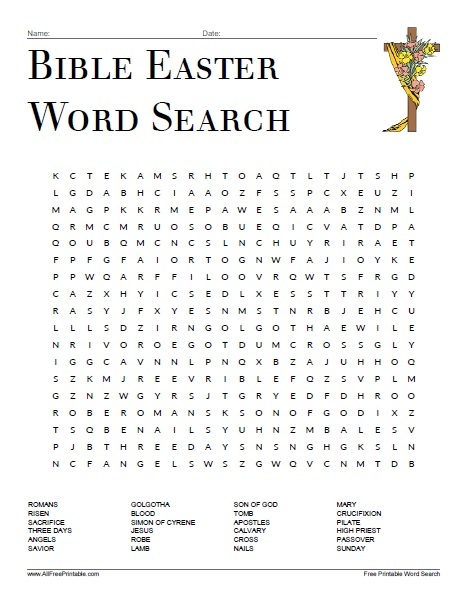 The Free Printable Bible Easter Word Search Puzzle is ready to print in PDF format. Thank you for this worksheet. My class wiil be more interesting and didactic though these crossword. I like a teacher have more options to teach english for my students.